Will the face of George change? The planning department envisions a "skinny" York and Courtenay Street where multi-storey commercial and residential buildings fill in the wide road reserves. GEORGE NEWS - The face of the CBD will change dramatically in the future if the George Municipality's guidelines in its draft spatial development framework (SDF) are to be implemented. Among others, it proposes "rationalising over-scaled road reserves and streets within the core CBD", starting with York Street and Knysna Road / Courtenay Street. This will create space for inclusive housing and economic development and enhance "walkability" and pedestrian safety. The SDF proposes that parking ratios should be revised to improve affordability of housing development in the CBD. The idea is to promote "inclusive, affordable housing in well-located and well-serviced areas where opportunities for sustainable livelihoods and jobs are highest and where access to social facilities is affordable". With 70% of the local population not owning a car, George should be a walkable city where the car is "an optional instrument of freedom rather than an essential", proposes the SDF. The same transformation through "inclusive, mixed-use growth zones" is also proposed for the Pacaltsdorp and Thembalethu CBDs. 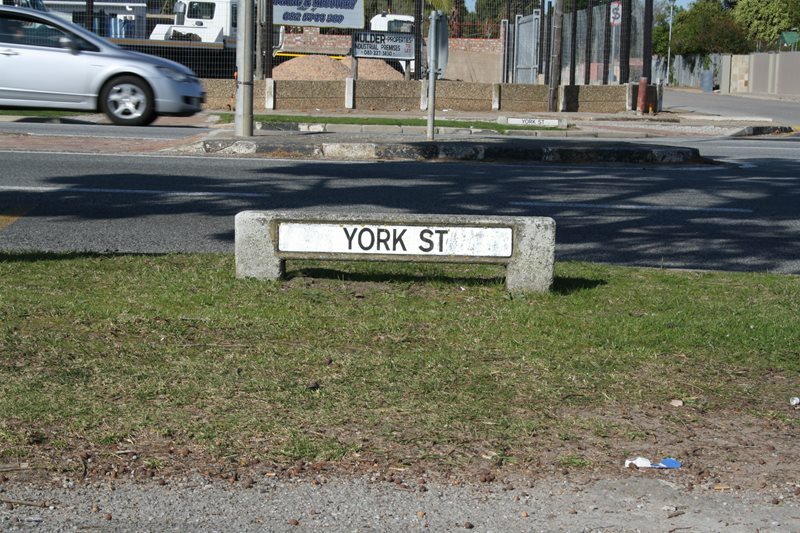 A section of York Street with its current layout. In some circles, these proposals have not been well received. Dr Andy Lamont, the late chairman of the George Heritage Trust, wrote last year that the SDF was a "blatant disregard" for the cultural landscape and that "the spatial importance of York Street and cultural landscapes that have been created at the entrances to the city deserve protection". Joh Groenewald, who has been writing in the George Herald about all the reasons why George is the best place to live, compares the proposals for narrower streets and high-rise buildings with New York's "concrete-hemmed wind tunnels" or "canyons". According to Ingrid van Wyk of the Glenwood Conservancy, "we and many other people moved here from Johannesburg and Pretoria for the lifestyle. Now they want to change the town atmosphere of George into a Durban city atmosphere. If I have to sit in the same traffic as I did in Centurion, where they also did what they are now proposing for York and Courtenay Street, it does not make sense for me to invest in George any longer. Traffic in these streets is already a nightmare in the mornings and when the schools come out." For people living in areas far from their jobs and struggling with accommodation, such proposals are attractive, says Sammy Vorster, Parkdene ward committee chairman. "In the brown communities many people have been on the housing waiting list for 15 to 20 years. "The houses in Parkdene are overpopulated and in every backyard there is a bungalow, often put up by parents for their children. Affordable housing for them nearer to their jobs and the shops will obviously be welcome. It will also bring back life to the CBD. These days it is even quiet during the holidays, while the malls are busy." Section of Knysna Road with its current open space in the road reserve. Responding to these comments, town planning chief Delia Power says no detailed planning has been done in this regard yet. "The SDF has put forward a proposal that may be disproved once traffic impact assessments and cost benefit analyses are done. It must be noted that the SDF is quite specific in that its proposals do not grant rights nor do they take rights away. All proposals of the SDF are still subject to a comprehensive process that must be followed before implementation."